A new year is upon us, and what have I been up to? The first priority was to deal with our insurance company’s building and repair agents about the appalling state they left the inside of our house when decamping on 22nd December. We managed to clean up much of the house and move back into our bedroom on Christmas Eve. Immediately after Christmas we bought and built a wardrobe to replace the one the decorators destroyed while working in the bedroom, and at the same time supervising replacement of three windows and a door destroyed in the fire last July. My friendly local builder came to apply another roofing felt cover to the leaking roof on the shed he had built. Like his previous efforts, this also leaked. I contacted some professional shed builders who have previously done excellent work re-roofing my (now burnt) sheds. With any luck I will have a dry workshop by the end of the month. Next job was to install mains electricity from the house to the summer house at the back of the garden, and from thence to the workshop. I also installed an IKEA strip light taken from the old wardrobe into the summer house (unfortunately before checking that it still worked!!!). With electricity installed it is now reasonable to return to the man cave to continue the Battle of Brighton (September 1940). I have some work to do in the shed to install shelving and sort out the mess of dumped stuff from the past few months. On the health front things are getting back to normal. My post-op. review is due next week. 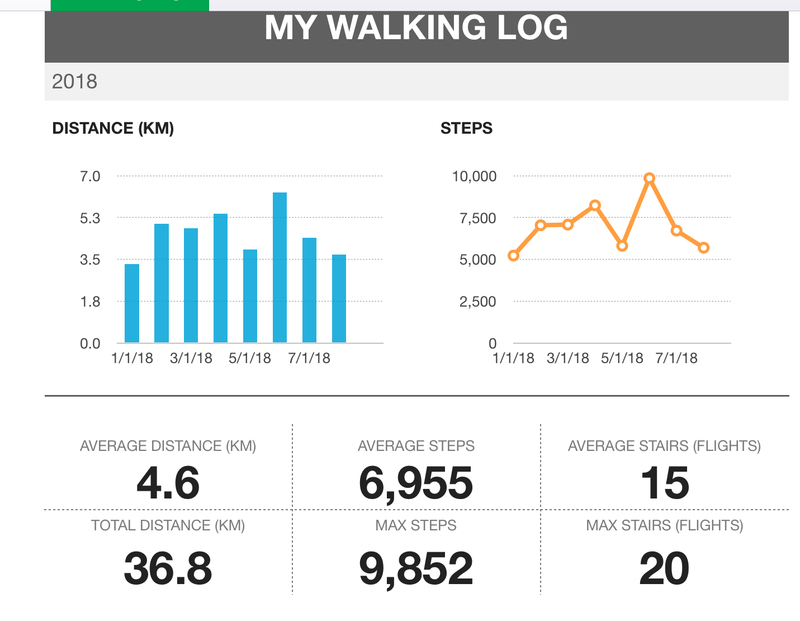 I have been keeping a track of health and exercise records this year. On the wargaming front I have been making occasional progress with the Battle of Brighton, which has now been dragging on for over six months. I have also been working on some painting and basing of 2mm and 3mm models for other campaigns. 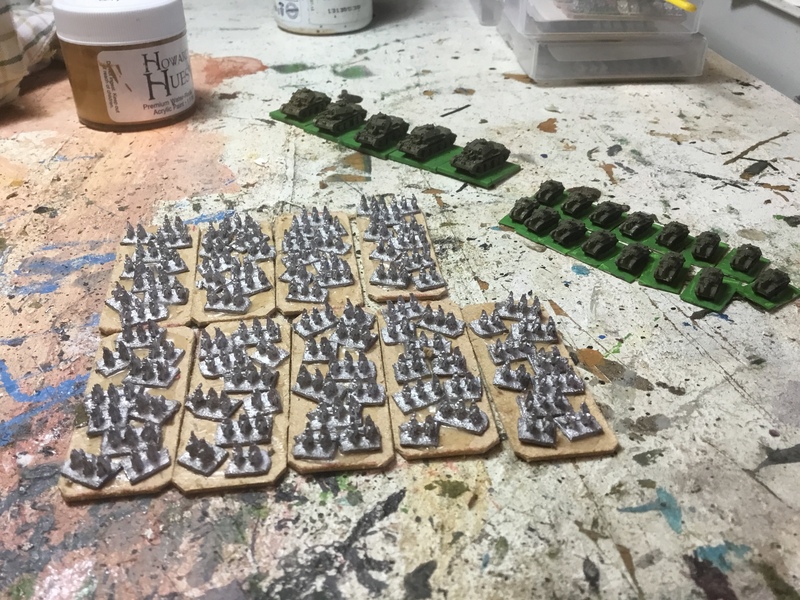 I am currently engaged in painting a batch of 2mm routing cavalry. In the background some A-13 British tanks in 1/285 and 1/600 scale for my 1940 games. I have also been creating replacement gaming pieces for my 1940 variant of the game: “Memoir 44”. My playing pieces are 3mm tanks, guns, trucks and infantry atop translucent 19mm square bases in grey (German) or green (Allies). They work reasonably well with the top-down view of the battlefield. I have also invested in two sets of top-down full colour card counters for “Panzerblitz” from Canada, which I can also use with the MM44 boards. So far a busy week or so.